’Tis the season when everyone loves to complain about Album of the Year lists. Choose your preferred gripe: it’s always the same albums on top, or my favorite album didn’t make this list, or ranking art is morally wrong, or it’s silly to compare Beyonce to the New York Philharmonic. But in spite of — or maybe partially because of — these arguments, AotY lists live on and proliferate as a tried and true format for curating the past year in music. 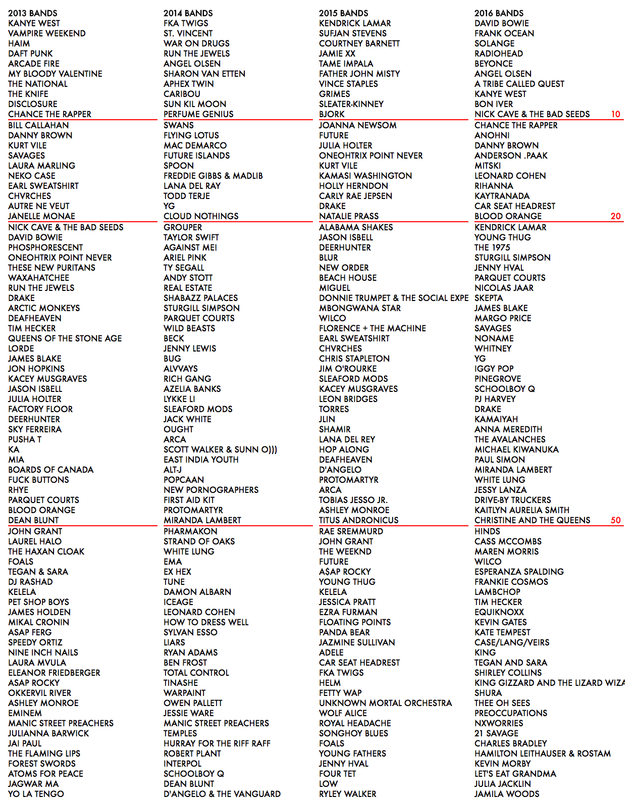 For the last four years, I’ve aggregated data from music publications’ AotY lists into a single spreadsheet. My primary reason for taking on this project wasn’t meta-criticism, but discovery, creating an easy way to find the albums that slipped past my attention over the last 12 months. Unfortunately, while getting all the lists in one place was somewhat helpful, sifting through hundreds of albums to find something new I might enjoy got a bit messy and random. But this year, I was fortunate to have the priceless assistance of Diego Garcia-Olano, a wizard of data science and visualization. We wanted to make the spreadsheet data easier to understand and apply, whether your intention is to see where a favorite album fell across different lists, isolate albums from a particular genre, or find a new favorite that you wish you had heard in time to make your own list. Each circle is an album, color-coded by genre. If you click on a circle, you can see where that album ranked across different lists. At the bottom, it will display some additional statistics, provides a link to listen to the album at YouTube, and recommends “similar” albums (see methods below) you might want to check out. Click the album’s circle again to un-select it. Hover over a publication in the x-axis, and you’ll get a pop-up box that shows its top 50 albums. Inside the box, you can hover over “Popular” or “Rare” to highlight the albums that appeared on many other lists or no other lists, respectively, or hover over a genre to highlight all albums that apply. On the right panel, you can filter the entire viz by genre, and then order the artists within that genre by alphabet or rank (using “consensus score,” the metric I use on the spreadsheet to create a universal ranking across lists). Or you can click on an artist from the master list and see where they appear in the various lists. In the genre column you can also isolate the “Sleepers,” which are albums that only appear on a small number of lists, but are ranked highly when they appear. As a bonus, Diego built a second visualization of the aggregate albums lists from all four years of the project. There, you can click any artist name (or the Random Button on the top left) and the YouTube link will open inside the viz for convenient listening (if you like an album, please consider buying it, musicians gotta eat). You can also build your own list and send it to friends or save it for later use: right-click the artist name to add the album to the panel on the right side, right-click it again to remove. You can add your own custom title for the list, add albums that aren’t already listed in the viz (ya hipster), and generate a custom link to send to friends and enemies. It’s not restricted to just “album of the year” lists either — you can make a “people who died in 2016” list, a “albums I need to check out” list, or an “albums that silly music writers chronically overrate” list, up to you. If there are any additional features you’d like to see added, please let us know. It’s still a work in progress; we need to add in missing genre information for previous years and have a bunch of additional functionality ideas to implement. 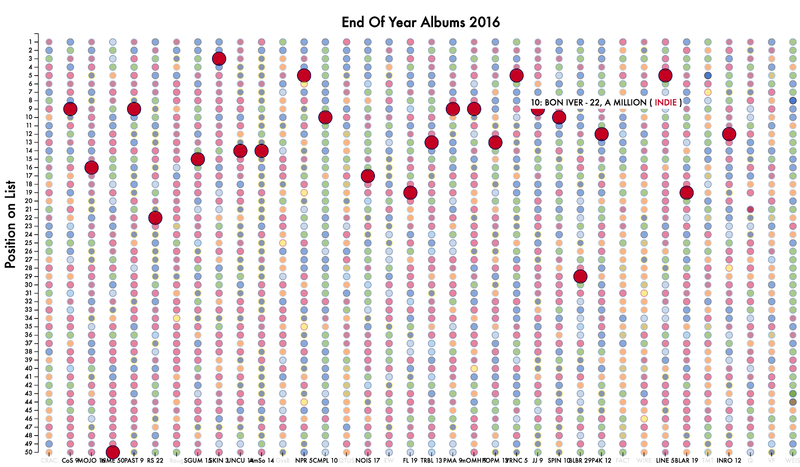 But hopefully, even in their current form, these visualizations are useful tools for you to sort through the music of 2016 in the year’s last couple weeks and find some new artists to support. Have fun! I write about science and music for the University of Chicago, Pitchfork and other places.